Anxiously, my wife and I sat on the edge of the boat, putting on fins, adjusting face masks, awaiting the guide’s nod to jump. We got it and launched ourselves, swimming behind him when-suddenly-we were eye-to-eye with a 40-foot leviathan, its mouth agape. We turned and tried frantically to keep up with the gentle monster. It was close enough to touch but soon slipped away. This was it-our first encounter while swimming with whale sharks in Donsol, Philippines. My wife and I had arrived early morning to this small coastal fishing town, 400 miles from Manila, on the southwest coast of Luzon Island. Both snorkelers, big time, we had read about whale shark encounters. Now on our eight-day Philippines tour, we had the opportunity for the experience. Regarding whale sharks, local fishermen were aware of them in Donsol but most of the world was not before 1998. That year a team of foreign divers visiting the area publicized the fact for the first time After that, poachers and hunters swarmed into the area. The government was quick to react and declared this variety of fish a protected species. These are not mammals like other whales but fish, belonging to the shark group. However, it is not a predator, feeding mostly on plankton The largest fish in the world, it grows to over 40 feet and can weigh some 39 tons. Eco-Tourism in Donsol is the big draw from February to June when the sharks migrate to feed on the annual plankton bloom. This small town of 30,000 becomes a busy place as tourists worldwide arrive. Local fisherman become guides and whale shark spotters. The morning of our encounters we boarded a small boat, typical in the country, with a narrow hull and an outrigger-stabilizer each side. The local boats have a capacity of six passengers and a crew of six, including our guide and a spotter who stands astride a bar some six feet above deck. Amazingly, the crew can spot sharks from more than 50 yards away. As soon as one was seen, the helmsman began maneuvering precisely toward the dark mass below the surface. Meanwhile, the guide whispered for us to get ready. The boat slowly crept forward, and we were signaled to jump in. The first time is breathtaking when you see the huge four-foot mouth, a small eye each side, coming toward you. Positioning yourself above it, you are close enough to touch the two dorsal fins on its back and two pectoral fins on its sides. Of course, while it’s tempting to touch, it’s verboten. Characteristically, whale sharks have distinctive light-yellow stripes and dots on thick dark gray skin. A filter feeder, it sieves enormous amounts of plankton through its gills as it swims. 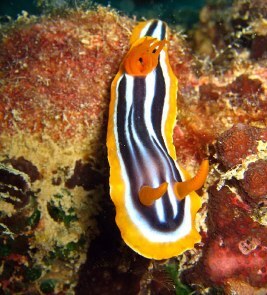 Often, several remoras (sucker fish) are attached to its side, riding along. Encounter rules dictate that boats can stay out for three hours. One boat is allowed per fish with a limit of six people allowed to interact It was noon, and after so many encounters, we were tired, getting in and out, and ready for lunch. We had arranged to be taken to a secluded beach. Relaxing, eating our sandwiches, we watched two young crew members scramble up a palm tree nearby to pick fresh coconuts. They gave us a couple and the sweet milk and succulent flesh sure tasted good. Following lunch, we took a short snorkel seeking out smaller fish this time. Returning to the dock, we lounged on the beach during the afternoon. Next on the schedule was an after-dinner night- time firefly-viewing river cruise. We were taken to the Ogod River where we boarded a small boat. Soon it was pushing upriver in the pitch dark, along an eerily silent riverbank. The only illumination came from a crewman’s flashlight at the helm. Only the silhouette of mangroves on the bank could be made out. Suddenly, it was as if hundreds of Christmas tree lights had been turned on in treetops on the left and then the right. The boat paused from time to time for us to take in this blazing show. After a fascinating two hours of this, it was time to head back to our hotel in Legaspi. We had flown into Legaspi the previous day and stayed the night there because Donsol was fully booked. Before checking into Pepperland Hotel, we were given a short tour of the city. The area’s big attraction is Mahyon volcano. We went to a spot outside the city to view the perfectly-shaped crater. From there, we took in Cagsawa Ruins, the remains of a church and village that was buried in a devastating eruption in 1814. Next morning, the hour trip to Donsol gave us an opportunity to see the countryside, a picturesque panorama of daily life in small farming villages. First off, the driver had to be on his toes. The narrow two-lane road was a jumble of traffic. Cars are expensive for Filipinos, making bicycles and motor bikes the preferred method of transport. For public transportation, there are buses, but most locals take tricycles and jeepneys to get around. Tricycles or pedicabs are motor bikes with a side car on a third wheel. It can hold two passengers (although many were stuffed with more riders) and are also often used for delivery. Jeepneys, as the name implies, are colorfully painted elongated Jeeps with benches installed. They can hold about eight and have regular stops but can be hailed, as well. Beside confronting this melange of traffic, the driver had to be wary of people, perilously close walking by. In addition, family houses are situated only a few feet back, which makes the roadside a center of daily life. People of all ages, as well as dogs, seem to spend much of their time roadside. Away from the villages, lovely rice paddies, all shades of green, dotted the landscape. For farmers, the flattest and best place for them to dry the rice was literally on the road itself. Ignoring traffic, they raked rice as cars whizzed by. Most drivers, respectfully, drove around, but occasionally one would heedlessly drive right through, leaving tread marks in the grain. In Donsol, whale shark-watching is a bargain. In dollars it figures out to $70 for two and much less when more are on the boat. With four, it is only $35 each. That the Philippines is a real travel bargain became even more apparent a few days later when we flew into the Palawan Islands for our stay at El Nido Resort. Off Palawan’s almost 1,200 miles of coastline are 1,780 islands and islets with rocky coves and white sandy beaches. It was a sight to see these green dots in the turquoise and blue sea as we flew in from Manila in a small two-engine plane. 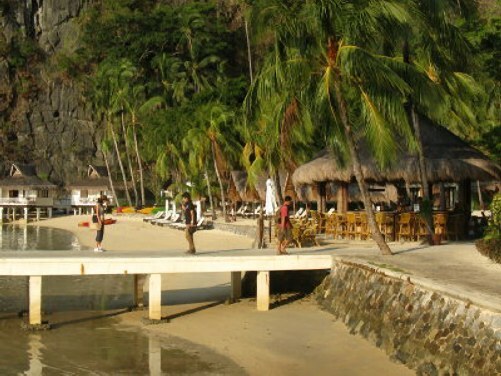 El Nido, itself, is secluded on Minoloc among 45 small limestone neighbors. This world-class resort, comparable to five star locations everywhere, is in a picture book setting-a cove studded with palms with a backdrop of sheer limestone cliffs. It has 50 rooms with thatched roofs, built with indigenous Filipino materials, some over water, others facing the bay. Behind, there are garden cottages and cliff cottages nestled high in the hillside. The wonderful thing here is the price includes all the activities. Each evening guests meet with a coordinator who plans the next day’s schedule with you. Some things to do are diving and snorkeling (many islands and spots minutes away), sea kayaking (including boat drop-offs in lovely spots), rock climbing (20 bolted sites to choose from), hiking and bird watching (monkeys or Palawan hornbills are among the species that might be seen), fishing (to nearby spots, boats leaving mornings and afternoon). So many options-or just relax on the beach under an umbrella. There is only a nominal $30 charge for dives. All meals are included too, and the food is delicious. One of the perks is lunch, awaiting at an island during your day’s outing. The price for all this is, almost unbelievably, $200 a day per person. We reckoned it would be at least three times higher in a comparable resort elsewhere in the world. After snorkeling, we headed to the outdoor restaurant where all meals were served. We enjoyed selecting assorted vegetables, meats and sauces and having the chef complete our stir-fry. A salad bar, shabu-shabu, sushi, pasta were all offered as were assorted meats and freshly caught fish. Breakfast featured quite an assortment: cereals, eggs, waffles, pancakes, fruits, salads and Asian items were plentiful and delicious. Back to midway in our trip. After Donsol, we flew to Damaguete in the island province Negros Oriental, internationally known as a prime location for divers. We were met and taken to the lovely resort of Pura Vida.. We were set to snorkel as well as venture into the area’s lush forested area and take in its isolated lakes. 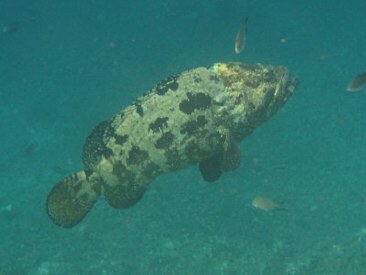 Pura Vida attracts mostly European divers. At the resort, several boats are available that go out to the many sites with Apo Island being the most famous. Our accommodations were great: large, well decorated bedrooms and extra large completely tiled bathrooms. While they’re air conditioned, we found that opening each window gave us a wonderful sea breeze. At night, after our snorkel and before dinner, we enjoyed sitting on the veranda – watching the activity at the beach and at the waterfall behind the large swimming pool. Above the door to each room is not a number but a name. Our room was Bannerfish. There was File Fish and an entire aquarium of colorful names. For dinner, we climbed the stairs to the second floor open air dining room where all meals were served. The menu consisted of local favorites as well as more familiar dishes: steaks, fish and pasta dishes. We enjoyed the fresh grilled fish for dinner. Our favorite side dish quickly became mango, plentiful everywhere, which we enjoyed plain for breakfast and with vanilla ice cream for dessert. Right off, first morning, we were taken to Apo Island. The Swiss divers onboard went one way-out to deep reefs; we headed to shore, toward lavish coral gardens and countless technicolored fish. It was a very good day. Among the sights was a four-foot black-and-white-banded sea snake which headed for my wife, frightening her away. A sidelight: Many divers are getting into micro diving which includes seeking out colorful nudibranches (sea slugs), which stay in deep water. According to our diver companions, this place was a good spot to look, showing us a photo of one they had seen that day. Up early next morning, we left for our sojourn into the forest. A four-wheel drive vehicle took us up mountain slopes on a sometime paved road. 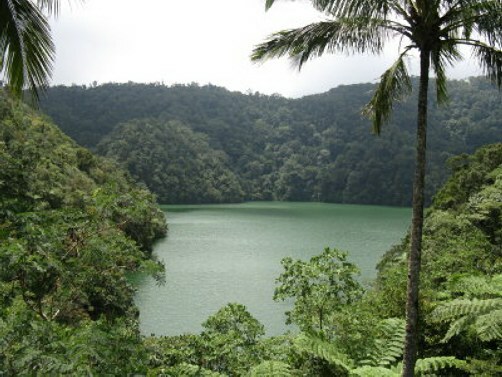 After an hour and a 3,000-foot ascent, we came to Twin Lakes National Park, location of the spectacular Lake Balinsasayao and its smaller sister Lake Danao, both ancient volcano calderas. We set out on a serene boat ride on the larger lake. In sight was a solitary fisherman, and from a distance, we saw a Japanese night heron. We heard birds secluded in the jungle canopy. Wild orchids hung from the trees. Midway, we docked and hiked up a quarter mile trail to view the smaller lake. 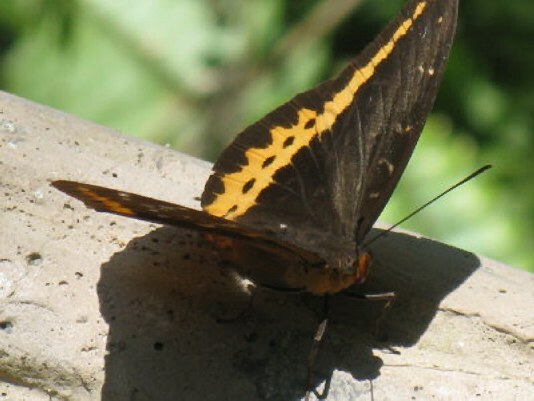 On the way we took photos of the beautiful butterflies that flitted around us. One flew away, landed on my wife’s hat, then returned to the railing where it continued to pose. On our return, we stopped for lunch at Jo’s By the Sea for positively the best barbecued chicken we’d ever eaten. Walking in, I noticed along the wall a row of sinks for washing up. This seemed strange until I became aware that our food was served without utensils. Everyone eats here with their fingers in the old Philippine fashion. Without a pause, we dug in. The secret at Jo’s is the marinade. The meat wasn’t slathered in sauce, making it easy to eat. Accompaniments were a mango salad and rice. All a bargain-less than two dollars U.S. Before leaving we joined the line to wash up. After shopping in town, we hurried our guide back to the resort in time for an afternoon snorkel. Pura Vida is located on the edge of Dauin Marine Sanctuary. Divers at the resort had casually said that snorkeling was good a mile up the beach. This proved to be an understatement. A short jeepney ride away, we dove in and-lo and behold-a wonderland of bright corals and multitudes of sea life-banner fish, clown fish, fusiliers, puffer fish, and on. It was one of those great moments. Serendipitous. As expected, prices were very attractive at Pura Vida:double room from about $88 a night, including breakfast. Emphasizing again, the Philippines are the best for travel bargains.